Hopes are high with four runners in feature races at Flemington on a Group I day on Saturday. The action is all early in consecutive races with Metson in race two, Radipole in race three and Savile Row and Saracino in race four. Metson (pictured) runs in the Exford Plate (Listed) over 1400m and Mike Moroney is very happy with the way the son of Canford Cliffs has trained on since his impressive win on debut at Cranbourne last month. “He’s done very well since but he is being thrown in at the deep end in a race of this class,” Moroney said. “We do have a lot of confidence in this horse and he has real ability so we’re happy to take them on. Patrick Moloney will again ride Metson who has drawn barrier eight. French import Radipole resumes in The Sofitel (Listed) over 1400m with Patrick Moloney to ride off the back of two pleasing jumpouts. 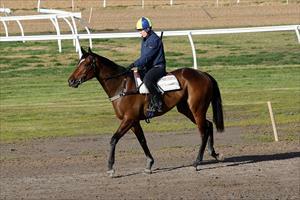 “We’re really happy with the way he’s come up but it’s certainly a strong race,” Moroney said. “There are proven horses at the trip and I think Radipole is a horse who will be better over further. It’s going to be tricky for Patrick from the barrier but there’s not much we can do about that. Savile Row is racing in Australia for the first time in the Bobbie Lewis Quality (Group 2) down the straight 1200m and Moroney is delighted with the way the entire has settled in to life at Flemington. “Couldn’t be happier with the way he’s settled in here, he hasn’t put a foot wrong,” Moroney said. “He’s been lovely to work with and he’s been nice and focussed in his work which is a positive sign. Saracino runs in the same race and Moroney is anticipating a softer track will suit the entire. “He has blinkers on first time and I don’t know there is that much early speed in the race and he has a good record down the straight,” Moroney said. “We can’t fault his work and is terrific to look at so things have gone to plan - it’s now up to the horse. “If he brings his real form then he’ll run a forward race and be competitive." Stephen Baster will ride Savile Row and Michael Dee is aboard Saracino.